The Chevy Cruze may be a relatively new member to the Chevrolet family, but its popularity in the compact car market promises that it will be around for years to come. Making its first appearance in the North American market back in 2008 as a four-door compact sedan, it replaced the Chevrolet Cobalt from the lineup. Since its debut it has sold over 2.5 million units, making it an undeniable front-runner in the compact car segment. Since the Cruze is so new to the automotive scene, it has only seen one generation—that is, until now. The all-new 2015 Chevrolet Cruze represents the first overhaul of the compact car, making if the first model year in the Cruze’s second generation. The 2015 Cruze may be a compact car, but it is packed with luxury features that some full-size cars can’t even contend with. The turbo diesel version of the Cruze is leading the charge for increased fuel economy, and the high-end trim level is both affordable, and brimming with features typically reserved for a much higher price point. This little car is easily one of Chevrolet’s shining stars, and the specifications of the Cruze, coupled with the large-volume sales numbers, work together to confirm that fact. What exactly differentiates the 2015 Cruze from its predecessor? As it turns out, the answer to that question is quite a bit. The overhaul from the 2014 Cruze to the 2015 model year was significant in many different ways. While some changes are small and may go unnoticed, they are as important as the obvious modifications made by Chevrolet. Luxury in the Form of Technology - Changing times call for changing technology. A new Text-Message Alert function reads incoming text messages through the vehicle’s speakers, and Siri Eyes Free integration enables voice-controlled connectivity—two new automotive technologies that are allowing drivers to keep their hands on the wheel, without missing a beat. OnStar 4G LTE Wi-Fi connectivity means that drivers of the 2015 Cruze, and up to seven devices, will easily stay connected no matter where their travels take them. The brand new Chevrolet “AppShop” will allow owners of the 2015 Cruze to download customizable apps to their vehicle directly, utilizing them for news, weather, and travel information. New Safety Features - Just as convenience technology has evolved, so has automotive safety technology. The Cruze comes standard with 10 airbags and with optional blind spot and rear traffic warning systems, rear-park assist, and a rearview camera. Safety has most certainly been updated in the 2015 Cruze! Enhanced Appearance - The Cruze got an exterior update for the 2015 model year, complete with a restyled front-end that draws inspiration from the Malibu and Impala. New exterior colors are also available with the new generation. Practical Interior - Revised cupholders inside the Cruze’s cabin make for easier accessibility to beverages. Door lock switches have been relocated from the center console to the front door of the vehicle, while the trunk release button has been moved to the center console. Leading the charge in fuel economy, the 2015 Chevy Cruze Turbo Diesel model leaves its competition behind, filling up once again, at the gas station. The VW Jetta TDI Diesel is the vehicle most comparable to the Cruze Turbo Diesel, and the Cruze outperforms in all areas. 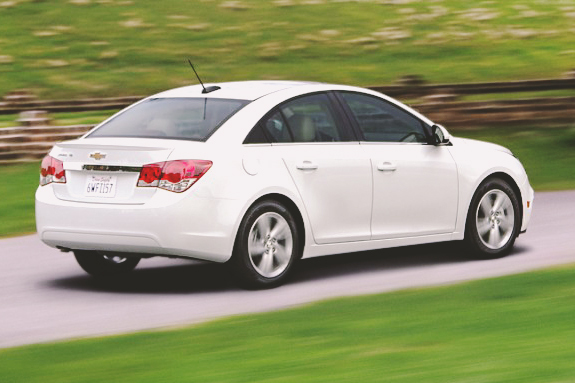 Better horsepower can be found on the Cruze, with 148 HP at 4000 RPM. The 2015 Cruze beats out the Jetta with 258 lb-ft of torque, while the TDI is left behind with only 236. If getting from 0-60 is important to you, don’t waste your time with the Jetta TDI. The Cruze Turbo Diesel can make the transition in just 8.6 seconds, leaving the Jetta lagging behind. The Cruze Turbo Diesel boasts 46 MPG highway, while the Jetta TDI tops out at just 42. Peace of mind when it comes to vehicle warranty is important, and the Cruze's powertrain warranty far surpasses the VW Jetta TDI powertrain warranty. With the Cruze Diesel powertrain warranty topping out at 5 years or 100,000 miles, VW’s powertrain warranty maxes out at only 5 years, or 60,000 miles. A big difference worth noting. When luxury matters, the Chevy Turbo Diesel definitely comes out on top. With authentic leather seating, it makes the Jetta TDI’s leatherette interior look like child’s play. Is it possible for Chevrolet to pack full-size luxury into a compact car? The answer: YES! The 2015 Chevy Cruze may be small, but what it has under the hood and inside the cabin, is BIG. Starting at just $24,270, the LTZ trim level offers extraordinary luxury, standard features, and technology beyond measure. StabiliTrak Stability Control System - Inspires confidence behind the wheel in even the worst of road conditions. Remote Vehicle Starter System - Comes factory installed, and makes getting out the door easy and efficient. Meridian Leather-Appointed Seats - For undeniable luxury, and unmatched comfort. Heated Front Seating with Three Warmth Settings - Allows for a comfortable ride, regardless of the weather. Chevy MyLink with Bluetooth - Makes staying connected on-the-go second nature. With the touchscreen in-dash system, it also makes connecting a smooth and effortless endeavor. Heated Outside Mirrors - Ensures visibility and safety, even in the most unpredictable of weather conditions. The standard LS Manual trim starts below $18,000, making the 2015 Chevrolet Cruze one of the most affordable compact cars on the road today. When it comes to needing practicality without compromising luxury, look no further than the 2015 Chevrolet Cruze.